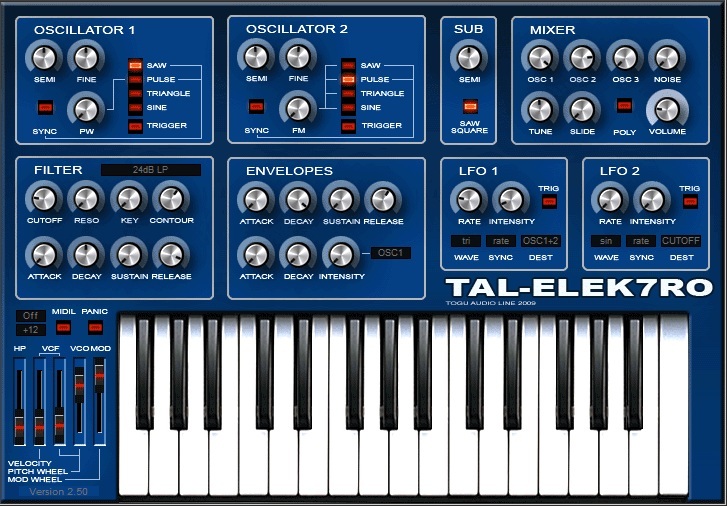 Tal-Elek7ro is a free virtual synth offered by Tal Software, a company located in Switzerland, and who creates high-quality virtual instruments and effects. 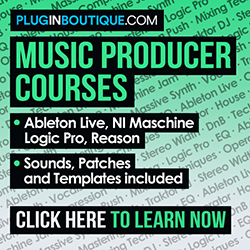 The product is a VST plugin, available in 32 and 64-bit versions. It is compatible with both Windows and Mac computers. It has two oscillators, a sub-oscillator, filter, envelopes and two LFOs. The Oscillators section shows two identical spots: Oscillator 1 and 2. There are knobs for Semi and Fine tuning, as well as buttons to select between the four available waveforms: Saw, Pulse, Triangle, and Sine. There’s a pulse width (PW) control (active when Pulse waveform is chosen), a Sync option (for Saw or Pulse only) and a Trigger button, which will reset the oscillator’s phase anytime a key is pressed. The Sub section sets the Sub Oscillator parameters. It has two waveforms available: Saw (red light on) and Square. There’s also a Semi knob for tuning in the range of +/- 12 semitones. The Mixer section shows volume controls for oscillators 1, 2 and 3 (Sub), Noise and also a global Volume knob. A Tune knob is also available, as well as a Slide control for portamento speed (mono mode only). Mono mode is set by default. To enable the poly mode, just click on the Poly button (red light on). Tal-Elek7ro has the maximum of 6 voices in poly mode. The Filter section has Cutoff, Reso and Key knobs. Contour knob will set the amount of the filter envelope to apply to the filter cutoff. The filter envelope comes with typical ADSR controls. There are also four types of Low Pass filters. The Envelopes section has ADSR knobs as well and will control the amplitude parameter. This section has a cool Assignable Envelope, with only attack and decay parameters, but with an Intensity knob to control the modulation width. You can use these settings to modulate some parameters: Osc 1, Osc 2, Osc 1+2, PW 1, PW 2, FM 1 and FM 2. The LFO section comes with two identical slots: LFO 1 and 2. Both have Rate and Intensity knobs, and a Trigger button. There are six different waveforms available: sine, triangle, saw, square, random and noise. Sync will make it possible to adjust the rate using 18 different rate types. Tal-Elek7ro has also Portamento mode on/off button, midi learn function, octave shift, and sliders to set pitch wheel and modulation parameters.